Suffering from Shooting Pain in your Lower Back? Do you have pain that starts in your lower back and then shoots down your buttock or leg? All of this pain and discomfort could be caused by the longest nerve in your body. Read this site in detail and discover how to get rid of back pain - THE NATURAL WAY! 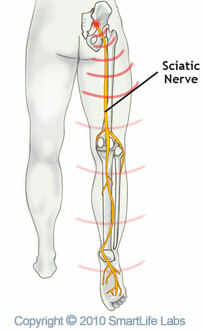 Your sciatic nerve runs from your spinal cord to your buttock and hip and then down your leg and foot. It controls many muscles in your lower legs and provides feeling to the thighs, legs and feet. Sciatic pain varies from a mild ache to a sharp pain running down your lower back, buttocks, hip or leg. Sometimes you experience numbness or loss of movement. Some days, you feel tingling or a pins-and-needles sensation in your toes. Are You in Pain Most of Time? Back pain called sciatica is often caused by a compressed or irritated nerve root from a herniated disk in the spine. The shock-absorbing disks in your spinal cord experience wear and tear due to age, heavy lifting, improper posture, accidents or diabetes. Whatever the reason, it is painful. Remedies such as hot and cold packs, exercise and physical therapy help sciatic pain to a degree. However, some people also reach for the quick and handy pain medications, which come with extra baggage-unwanted side effects and dependency. NSAIDS like aspirin or ibuprofen (Nuprin, Advil, Motrin) can cause nausea, vomiting, diarrhea, constipation, decreased appetite, rash, dizziness, headache, and drowsiness. Acetaminophen (or Tylenol) can cause liver damage if not taken in the correct dose. For many people acetaminophen does not completely relieve their pain because it does not work to reduce inflammation. Oral steroids can cause weight gain, stomach ulcers, osteoporosis, collapse of the hip joint, as well as other complications in some people. Can Sciatica be Cured Naturally? For effective relief, you need Mother Nature's intervention to provide potent, effective and safe results. 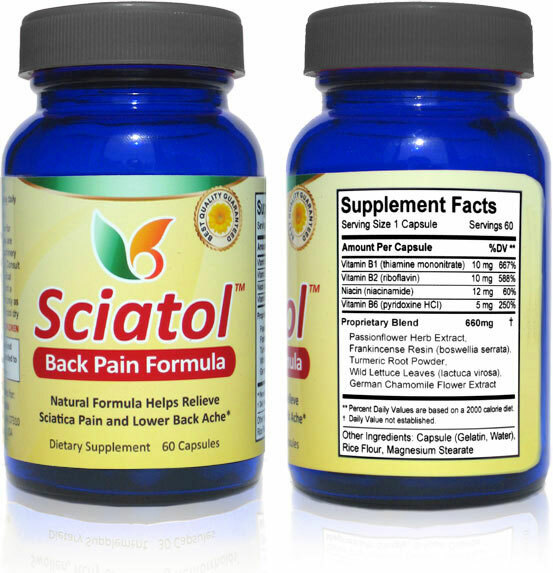 Sciatol™ is a natural supplement specially formulated for supporting the health of the sciatic nerve, spine, and nervous system. Containing six potent ingredients and carefully chosen by scientists and expert herbalists, this formulation is your best helper for pain and discomfort from sciatica. 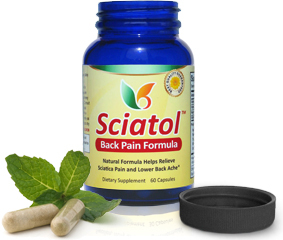 With Sciatol™ you can turn your back on sciatic pain and return to the life and activities you love. Is Sciatol™ Right for Me? Do you often experience one or more of these symptoms? If you answered yes, Sciatol™ is for you! 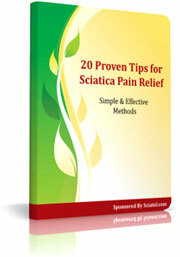 "20 Proven Tips for Sciatica Pain Relief"
Order Sciatol today and we'll immediately send you, by e-mail, a $19.99 eBook - Tips for Dealing with Sciatic Pain - which is yours to keep. FREE! What Are the Ingredients in Sciatol™? has been used throughout the world for over a century. Its latex sap-like substance, lactucarium, has been shown to reduce pain by limiting inflammation by actually preventing the expression of genes that cause inflammation. Once deactivated by the compounds in Opium Lettuce, these genes do not create the enzyme, and the pain is greatly reduced . is made from the sap of the Boswellia tree, known for its use throughout history as a perfume and incense. This vital component of many healing and religious rituals throughout India and the Middle East has been widely studied by aromatherapy practitioners for its benefits to pain sufferers. Plant chemicals found in frankincense resin helps reduce pain and inflammation by attaching to the enzymes that encourage the body to create the chemicals that build up and cause inflammatory pain . When this herb slows down the enzymes, the inflammation is reduced . is an important part of several supplements as it helps maintain a healthy body and immune system. Though B vitamins are available as part of a healthy diet, many people are found to be lacking in essential ones. Supplementing vitamins B1, B6 and B12 together has shown to help prevent back pain, reducing the amount of anti-inflammatory medications needed by sufferers . B vitamins act on the neurological system, strengthening cellular structure, and, in turn, reducing inflammation. have been used throughout Europe as a relaxant and stress reliever for many years . Scientific studies show its properties protect cells from inflammation and mutation, as well as in reducing cholesterol. Anti-inflammatory properties found in one portion of the flower reduce the pain associated with the inflamed nerve cells responsible for sciatic pain . Chemical components found in another part of the flower actually bind to receptors in the body to act as a muscle relaxant . a spice used in cooking, is also used traditionally throughout the world to relieve pain caused by inflammation . It acts in two major ways: preventing the process of inflammation by interrupting the chemical chain of events responsible for it, as well as acting directly on the inflammatory substance, decreasing its production . Arthritis sufferers have reported favorable results using turmeric for pain relief. Recent studies show its effectiveness in reducing pain caused by inflammation of the sciatic nerve. has the same effect on brain chemicals controlling muscles as a 1.5 mg dose of the muscle relaxant medicine Diazepam . Because of this activity, it is a potent herbal muscle relaxer, which is often used alongside Chamomile to extend the muscle relaxant activity. Why is Sciatol™ More Effective than Other Products? For centuries, Mother Nature has provided healing and relief from her arsenal of herbs, leaves, flowers, roots, and seed extracts. But while other products simply rely on traditional knowledge and unproven folklore, Sciatol™ has been scientifically tested and proven to relieve the pain associated with sciatica. We stand behind our product! Sciatol was scientifically formulated based on clinical research. Sciatol is manufactured in FDA certified labs that exceed the highest standards for quality control, safety and ingredient purity. Many of our customers report a quick sciatica relief. So can you! If you're not satisfied, simply send us your unused portion and we'll promptly return EVERY PENNY, including shipping costs. Unconditional 60 Day Money Back Guarantee. No waiting. Your order ships the same or next business day. We never re-bill unless you re-reorder. Your order is packaged discreetly in a PLAIN BOX. Sciatol is manufactured in the USA according to the FDA standards. All ingredients are well-researched, natural, safe and effective. Take 2 capsules of Sciatol™ per day and get natural and safe pain relief and start enjoying your life again!